It is a natural compound involved in producing energy from your body. It delivers this in the form of Adenosine Triphosphate (ATP). Made in your liver, almost 95% of your body’s creatine content is stored in the body’s muscles. The other 5% is to be found in your heart, brain and lastly the testes (for the men oviously). Creatine is constantly being produced and used by your body, and once it has been used it is converted into a waste product known as creatinine (note the extra ‘in’). You get rid of this waste via your urine. Is It Suitable For Every Fitness Activity? The answer to this one is; NO. Creatine works by increasing your ability to rapidly produce energy. The obvious advantage here is that you will be able to train harder, it will allow you to train more often, and this combination can produce results in a far shorter timescale. Because of this trait creatine is most effective for those who concentrate on high intensity training, and those involved in high intensity sports. It is ideal for serious weight lifters and those who want to get the maximum from weight training and gym time. It is also beneficial though for sports which require short, sharp bursts of energy and effort. Sprinters, baseball players and footballers are good examples. It is not felt to be that beneficial to longer distance athletes, marathon runners, or those who are involved in endurance activities. But if you’re still not sure, read what creatine is used for. So if you think you can benefit from the use of a good quality creatine supplement, it’s important to next be aware some of the positives and negatives it can have. There is no doubt that creatine can make you stronger, and it does so in a big way assuming you are putting maximum effort in. The reason it is so popular when lifting weight is that it works best when maximum effort is required for periods of up to 30 seconds. Those who use creatine over an extended period can certainly gain plenty of muscle mass. Your muscles become larger and heavier. This mass partly comes in the form of water. This is because creatine helps your muscle cells get bigger, and the bigger they get the more water they hold. Creatine speeds muscle recovery because it reduces the accumulation of ammonia in the muscles, and also delays muscle fatigue and soreness. Pretty useful. It Doesn’t Work For Everyone! There is a curious thing about using creatine. Whilst it definitely works for a lot of people, it simply doesn’t for some. It seems to be some kind of genetic thing. And there’s simply no way to tell in advance. So don’t listen to the nay-sayers or the raving fanatics – try it for yourself to see how it works for you. You should feel some benefits within a week if it’s going to work for you. But bear in mind creatine is for women too, this is not just something that works for men. Creatine draws water to your muscles and this process increases your risk of dehydration. It is vital that you drink plenty of water while using a creatine supplement. Users of creatine sometimes report such problems as diarrhea, bloating, nausea and upset stomach issues. Although many users have no unpleasant side effects at all. There’s no doubt than creatine can offer good benefits to your workout, if you’re lucky enough to fall into the camp that it works for. Unfortunately the only way to know for sure is to try it. 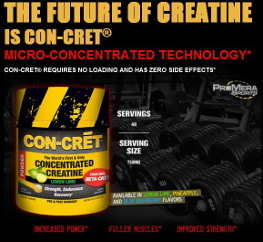 But make sure you buy a quality brand (such as con-cret creatine by Promera Sports) as you want to know exactly what is in the product. There’s a lot of rubbish sold in the fitness supplements market. Also, don’t be tempted to go for a fancier sounding liquid creatine, or ethyl ester version, as this has been proven to simply break down in your blood stream. Definitely go for the powdered creatine.